Cartridge yields approximately 970 pages. HP 78XL, (C6578AN) High Yield Tri-Color Original Ink Cartridge - HP 78 large tri-color inkjet print cartridge produces outstanding plain-paper image quality, photo-image quality on special media, exceptional lightfastness, and the best combination of speed and print quality in any print mode. Cartridge also includes a printhead to automatically tune up" the print quality with every cartridge replacement. Designed for use with Hewlett-Packard Color Copier 180, 190, 280, 290; Deskjet 920C, 940 Series, 930C, 932C, 935C, 950C, 952C, 960cse, 960cxi, 970cse, 970cxi, 990cm, 990cse, 990cxi, 995c, 995ck, 1220cse, 1220cxi, 1220c/ps, 3820, 6122, 6127, 9300; FAX 1220/xi, 1230/xi; Digital Copier 310; Officejet 5110 Series, g55xi, g55xi, g85xi, g85xi, g95, k60, k60xi, k80, k80xi, v40, v40xi, 5110, 5110v, 5110xi; Photosmart p1000/1000, p1000xi/1000xi, p1100, P1100xi, 1115, 1215, 1215vm, 1218, 1218xi, 1315; PSC 750, 750xi, 950, 950vr and 950xi. On the insert: This product has a limited warranty. If product is defective, contact HP or your retailer before the end of warranty date. The illustration shows the date marking location. Warranty does not cover empty or refilled products, or products that have been misused or tampered with. 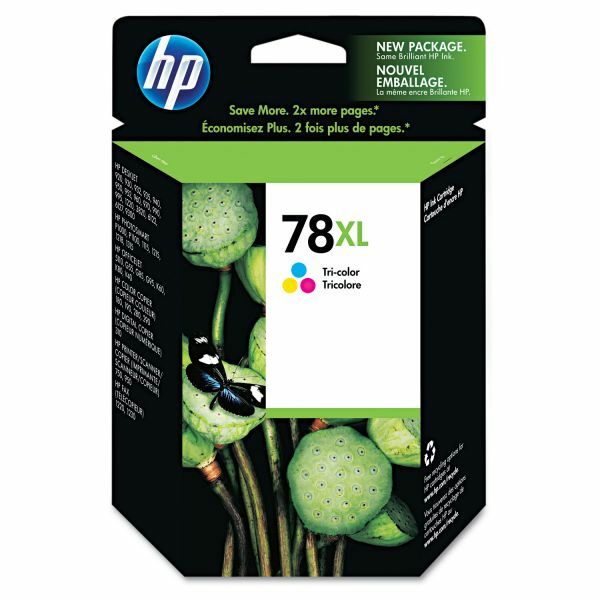 Until the HP ink is depleted or the end of warranty date has been reached, whichever occurs first.